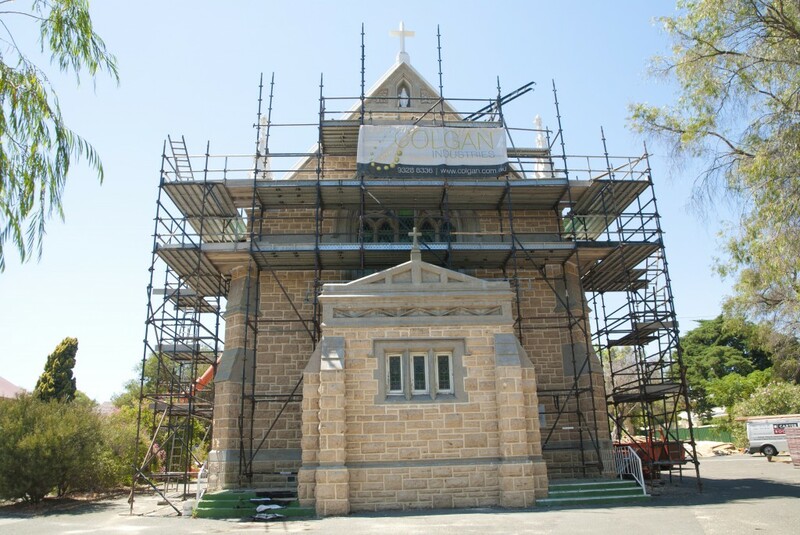 The restoration of Cottesloe’s 109-year-old Catholic church, St Mary Star of the Sea, is almost complete. The extensive repair work which began on the gothic-style building in November is due to finish shortly after Easter this year. However, due to several additional problems found with the building since work began, the parish is struggling to finance the restorations. “We didn’t intend to do the roof, but suddenly we discovered that we had to do it otherwise it might collapse,” assistant priest Father Wilson Donizzetti said. It’s estimated the unexpected cost of repairing the church roof will be about $120,000. Further damage was caused to the building when the side entrances to the church collapsed after torrential rain hit the area in January. Building designer and member of the project management team, Tommaso Trentin, said the building urgently required attention. “The roof was becoming quite hazardous,” he said. Internally, the church has been completely emptied in order to repaint the walls, install new carpets, and to replace the previously orange-carpeted sanctuary with marble flooring. The parish Masses are now being said in the church hall, enabling the internal renovations to progress faster. Fr Donizzetti said parishioners of St Mary Star of the Sea had been instrumental in assisting with the restorations. “The parishioners have been really good,” he said. “When the renovations started, the young people started to help to do some physical work, so it has been a way that they’ve got involved in the parish. Fr Donizzetti said although the project has had its difficulties, the final result would be worth the effort. “It’s a beautiful church, and this church is a real icon for this area,” he said. St Mary Star of the Sea church was designed by well-known architect Michael Cavanagh, and was just the second place of worship built in Peppermint Grove in 1904. Parishioners are raising funds to cover the cost of the repairs by holding a raffle of which the first prize is a pilgrimage to Europe or $5,000 cash. The nearby parish of St Thomas the Apostle in Claremont has generously thrown its support behind the fundraising, volunteering to sell raffle tickets at their parish. Tickets will also be sold at local shopping centres, and it is hoped that more parishes will help to raise funds for the church restorations. Matthew Biddle is a journalism graduate from Curtin University (2007) who began writing for The Record in 2008. He then furthered his academic repertoire by completing a degree in the liberal arts in 2011. Often mistaken for his identical twin brother, Matthew is a keen AFL follower and a long-time Essendon supporter.